Select Crest Whitestrips are on sale for $10 off this week and are producing an unadvertised $10 Extra Care Buck! *If you got the Crest White Strips Sample in the Mail there is a $10 coupon in there too! 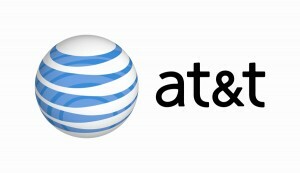 If you are an AT&T customer, you may want to try this one! Get 1,000 FREE rollover minutes with AT&T whenever you text "Yes" to 11113020! This promotion was intended for iPhone users but seems to be working for everyone! 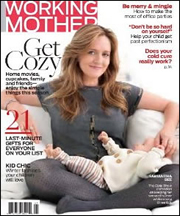 Get a FREE 18-month subscription to Working Mother Magazine. You will not receive a bill! Did this last year and it worked just fine. BOGO at GAP with Coupon! Head over to Coupongeek to find links to many new downloads. You can get a Baby Sling from SevenSlings.com for FREE with promo code: FAMILY2011 at checkout. You just pay $11.95 for shipping and handling. These retail for $39. Or you can grab a sling with matching baby legs for only $16.95 shipped with the same promo code!! UdderCovers.com just released a promo code: VALENTINE to get a FREE Nursing Cover (normally $32!!) since it is World Wide Breastfeeding week! You will have to pay $9.95 for shipping. This would make a great gift! They also have 3 Piece Udder Cover Gift Sets for only $5.00 after the code!! So only $14.95 Shipped! No more Rack....with Michelle in mind. So my niece is getting married this summer! Wheeeeeee! you could order 2 of these sets for $24 shipped. 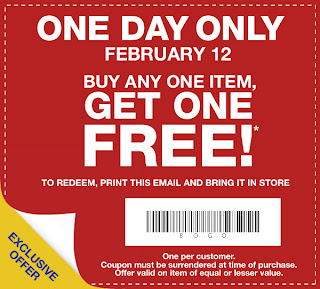 Make sure you use a new account with the coupon code P1070 and get $10 off, so lots of everyday silverware for $14! LOVE YA! More infor and link to Nomorerack HERE. Brunswick is offering a FREE download of Printable Valentine's Cards. Each card contains a coupon for a FREE game of bowling! Free companion airfare with purchase!!! Taco Bell wants you to think outside the bun with a FREE Taco Bell Crunchy Taco! Just visit Taco Bell’s Facebook page and “like” them. Then, click the link provided for the free taco. Getting the itch to get out and play??? Not so great outside here... but we can always plan! Head here ://www.accessibleplayground.net/ to find a list of accessible playgrounds. Click on the top tab to access them by state...VERY interesting! You can find the playground directory and the featured playgrounds listed at the top of your screen. The resources are listed by category on the left of the page. Head HERE to request your book. Let me tell you, the site is sponsored by an attorney group...so enter your info at your own risk. You may be looking for law information, so it may be positive for you, or maybe you are not. It looks like it could be a good resource since it is by state! This Survival Guide includes a Parents Care Notebook designed to help organize and track important health information and resources. Starting Friday, 2/8, Seventeen will be giving away 10,000 FREE Milani HD Advanced Lip Color! Just go to seventeen.com/milani and enter code: kiss to claim your FREE Lipstick! find it under Providence RI. Trying to get a bigger coupon collection? ...go to the P&G Everday Solutions facebook page. ”Like” them and then click to get your coupon booklet. It will bring you to the P&G Everday Solutions website and you can then login or register for an account to request the FREE $110 P&G Coupon Booklet!! Recycle Bank has reset their page, so even if you earned points playing the games last month, you can earn them again! Todays deal is a $10 off FTD flower order for just 5 points. I noticed many magazine subscriptions for 115 points, also. Of course, they have the typical coupons as well! Aren't a part of Recycle Bank? Learn more Here! Brielle likes when I find these....I think. Amazon is offering a FREE $2 MP3 gift for Valentine's Day with code VDAYMP3S. 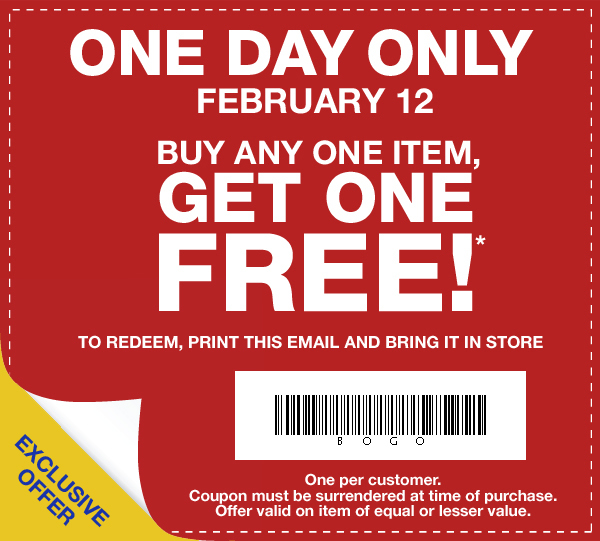 Free rental code, for today only, FEB7MOVIE. Enjoy! for $10, you get $20 worth of books, educational games and toys, movies, and gifts at Barnes & Noble. This Groupon is valid for purchases made online, at any of more than 700 Barnes & Noble retail locations, or on Barnes & Noble’s e-reader, the Nook. Limit 1 per person, may buy multiple as gifts. Limit 12 climbers per group. Reservation required for groups of 6 or more. Must sign waiver. High climbs are not transferable to other climbers. Must use in 1 visit. Not valid with other offers.